For so many years email has been one of the most effective tools of digital marketing. Based on The Radicati Group report, in 2015 the total amount of sent and received emails per day equaled 205 billion. 112,5 billion of them were business emails. In 2018 this number has increased by 5%, and it is expected that in 2019 such growth tendency will continue. While interacting with both current and prospective customers on the everyday basis, think about the marketing strategy that could turn this communication into more conversions. The content you deliver in the email is important, that’s true. However, have you ever thought that a professionally created email signature can be a solid marketing opportunity? 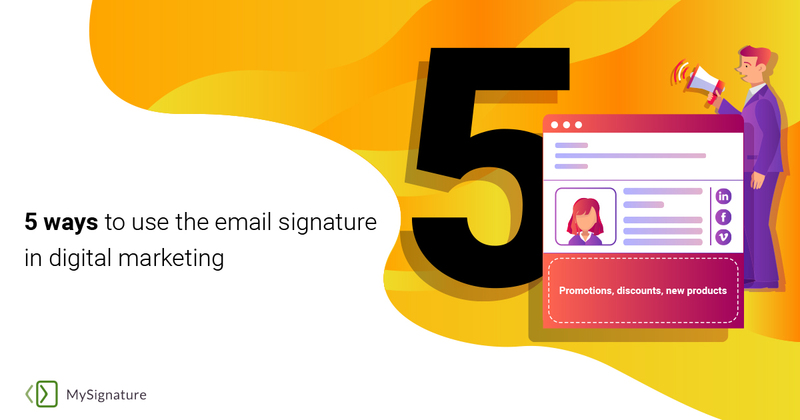 We’ve prepared 5 ideas of how you can improve your marketing strategy through an email signature. Your website is the place where customers can find complete information about the products or services you provide. To avoid directly advertising it in the email body, you can simply indicate it in your email signature. 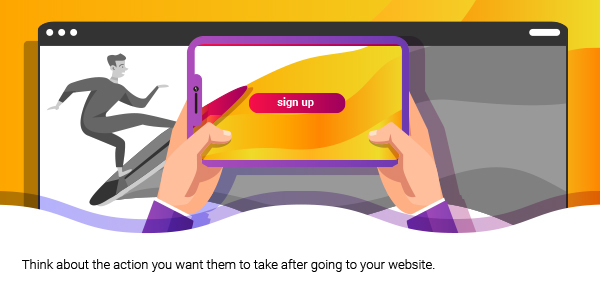 However, when you decide to promote your website in this way, make sure the homepage looks good and won’t make customers leave it in a few seconds. Additionally, think about the action you want them to take after going to your website. Your homepage may induce to subscribe, sign up, get a demo, start a free trial, or even buy something. It would be smart to embed a link to your blog in an email signature. A blog is the source of information. It regularly updates and delivers valuable information to the audience. 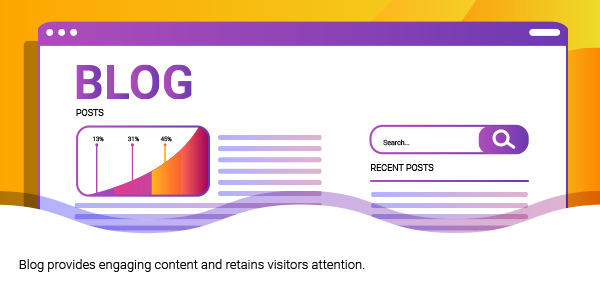 While your website homepage suggests that the customers take some action, the blog provides engaging content and retains visitors attention. It doesn’t mean you can’t include any call-to-action to your blog posts. A blog is a marketing tool, and it helps turn readers into leads. So encourage them to go further, subscribe to the blog, try a free product version, or anything like this. Make recipients click the link to your blog directly from the email. Social media doesn’t stop growing. Facebook, Instagram, and YouTube are currently at the top. Just imagine, this year the number of monthly active Facebook users has approached 2.2 billion. In 2015, more than a half of offline and online purchases were influenced by Facebook. 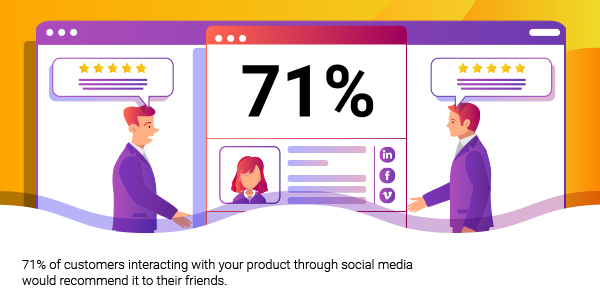 According to Ambassador, 71% of customers interacting with your product through social media would recommend it to their friends. Social media helps increase brand awareness and win more customers. 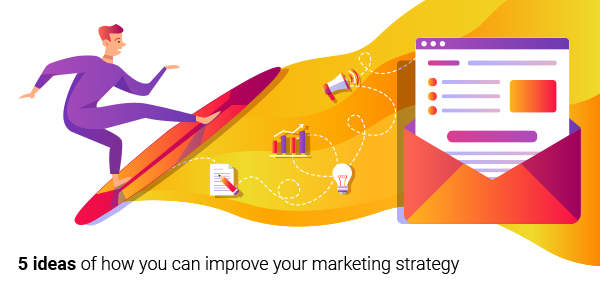 So if you deal with such kind of marketing, be ready to customize your email signature with corresponding social media icons. Speaking at the conference or webinar? Modify your email signature to display that and inform the intended audience. It doesn’t guarantee that everyone receiving the email from you will register for an event. But it definitely guarantees that everyone will be informed about it. 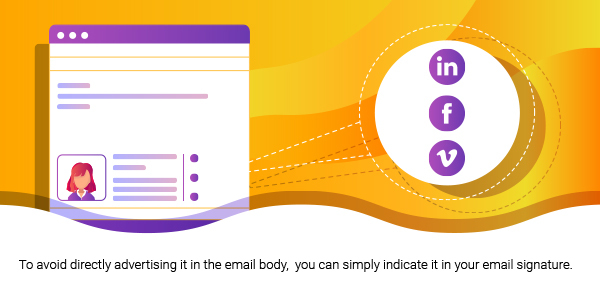 The email signature banner with the event advertisement should contain the basic info and call-to-action such as ‘register’ or ‘buy a ticket’. By the way, MySignature allows you to track the click-through rate, so you can see how effective your ad banner is. Promotions, discounts, new product offerings are the main drivers that help increase clients’ loyalty and build trust with a brand. 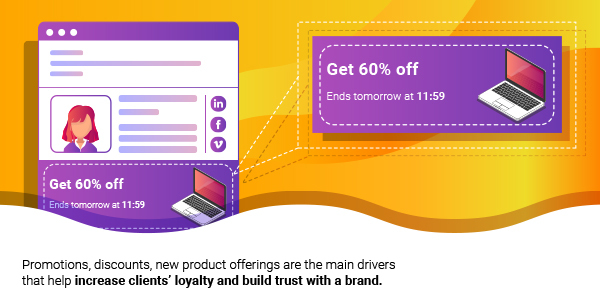 When launching, let’s say, a major discount campaign, make sure all customers are informed about this upcoming event on time. The most effective way to enhance awareness is to add a banner to your email signature that will display the key information. The banner should be clickable. It will allow recipients to go to the webpage with more details about discounts straight from the email.